The teams clashed in Semple Stadium tonight. TIPPERARY BOOKED THEIR place in the semi-finals of the Electric Ireland Munster minor football championship last evening. Charlie McGeever’s Premier County whipped visitors Waterford by 12 points at Semple Stadium. Second half goals from Jack Delahunty and sub Brendan Martin bolstered the Tipperary challenge as Waterford were sent to the playoffs. Tipp were just two points clear at half-time, 0-8 to 1-3, and they had to come from behind to edge ahead after dominating the majority of the first-half. Tipp were 0-5 to 0-1 clear but Waterford rallied to lead when Shane O’Meara’s palmed effort was adjudged to have crossed the line from Conor Murray’s pass. Dual star Stephen Quirke missed some chances but the hurling captain still managed to collect three points from play in the first half in a dominant display. Tipp, powered forward by Jack Kennedy, recovered from a point down, 0-5 to 1-3, to lead at the break before pulling after half-time. Waterford managed four points in the second period, just the one from play straight after half-time, as Tipp tagged on 2-8. Delahunty netted in the 35th minute after Waterford goalkeeper Kevin Dwane spilled Kennedy’s shot on goal before sub Martin added a second goal midway through the second half. Tipp will play a winner from the playoffs in their next outing on 13 May. Scorers for Tipperary: Jack Kennedy 0-5 (0-3f), Jack Delahunty 1-2, Brendan Martin 1-1, Stephen Quirke 0-3, Aidan Buckley, Tommy Nolan 0-2 each, Ross Peters 0-1 each. Scorers for Waterford: Shane O’Meara 1-0, Sean White 0-3 (0-1f, 0-1 ’45), Conor Murray 0-2, David Looby (0-1f), Michael Sweeney 0-1 each. Email “Job done by Tipp as they claim 12-point Munster minor success against Waterford”. 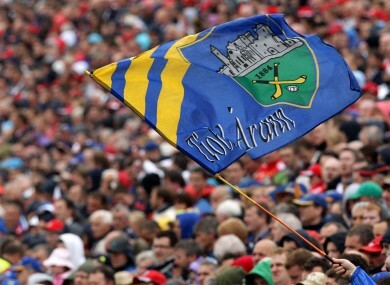 Feedback on “Job done by Tipp as they claim 12-point Munster minor success against Waterford”.